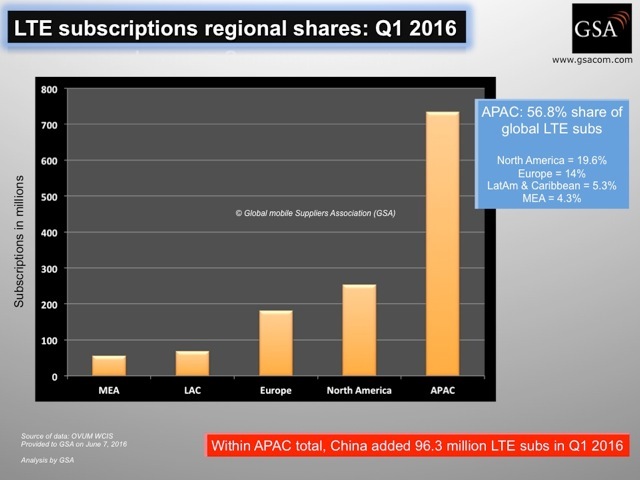 LTE uptake is continuing to grow at an impressive rate as Q1 2016 saw subscriptions worldwide double to 1.29 billion, according to the GSA. Figures released by the Global mobile Suppliers Association suggest LTE is currently growing faster than any other mobile communications technology. Earlier this year the number of LTE subscriptions rose above 1 billion for the first time, at which point daily growth was measured at about 1.7 million additions every day. According to Alan Hadden, VP of the GSA, daily growth has now risen to an average of 2 million additions, and that number is predicted to rise sharply in the approach to 2020. By the end of 2016, LTE subscriptions are forecasted to rise to over 1.5 billion, but that number will take off substantially over the next four years. 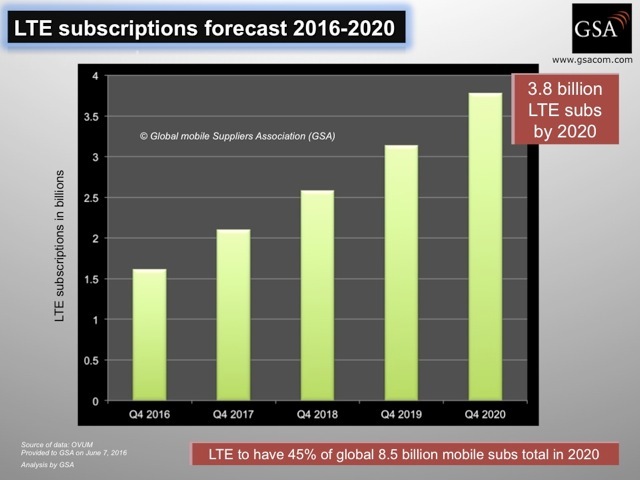 GSA numbers predict LTE subs to hit 3.8 billion by the end of 2020, and will have cleared 3 billion by the end of 2019. Globally, Asia is by far the biggest contributor to global uptake, with the region responsible for more than 50% of subscribers totalling more than 700 million. Specifically therein, China added almost 100 million subscribers to grow to half a billion users – representing a sizeable chunk of the overall Asia market. The USA and Europe follow up with 19.6% and 14% of the world market respectively. On a broader devices level, research from IHS says the world now contains has more than 8 billion connected devices – including smartphones, tablets, personal computers, smart TVs and TV-attached devices like Apple TV or Chromecast. In its research, IHS says smartphones now outnumber tablets five to one, contributing an additional half a billion new devices to the market every year. By the mythical 2020, the analyst firm predicts that ratio will expand to 10:1.